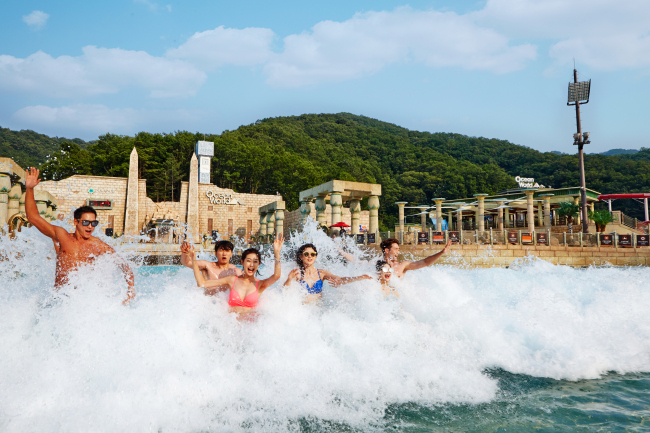 HONGCHEON, Gangwon Province -- Vivaldi Park’s water park Ocean World has always been a big draw for both adults and kids, but its latest attractions bring a different type of appeal. 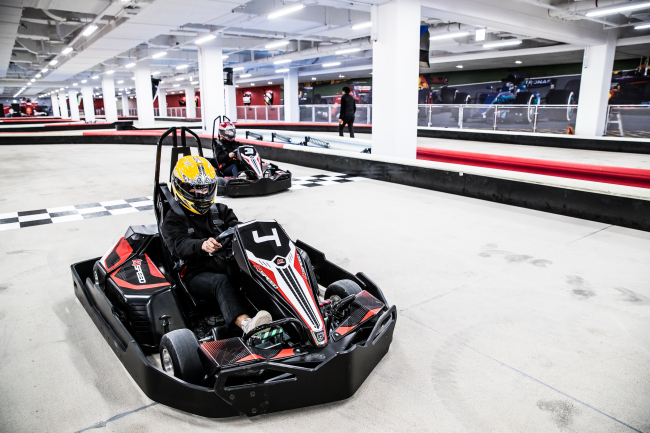 It is not easy to find high-speed go kart tracks in Korea, but K1 Speed, an indoor go kart racing company based in California, has opened its first track in Asia at the Vivaldi Park resort in Hongcheon, Gangwon Province. The track at Vivaldi Park is 202 meters long and 3,057 square-meters wide, with its karts that can reach 30 kph. Sure the speed doesn’t seem much on paper, but it feels very different when you’re in a go kart and racing up to nine others around the winding track. It is nothing like being behind the wheels of a sedan as you feel the pressure of every sharp turn as you speed past your competition. The adrenaline rush from the speed and the competition is extremely addictive. Each race consists of 10 laps, and the top time and average time for each lap is recorded and presented to you after the race. The top records of the day, week and month are on display, and seeing your name up there can be a serious ego boost. The operating hours are between 10 a.m. and 9 p.m. during the weekdays, 10 a.m. to 10 p.m. on weekends. A single race costs 33,000 won for adults, with discounts for members and local residents. Those over the age of 8 who are at least 130 centimeters tall can participate. While not quite on par with the K1 in terms of speed, outdoor Luge World is another new attraction that is pretty fun. It is not an actual Olympic luge but more like a sled on wheels that can be controlled with a handle. You drive it down the ski slopes that has been rearranged for about five minutes. It is not for thrill-seekers, but the driving is very easy and safe and anyone can enjoy it, although children under 110 centimeters tall must do so with a guardian. 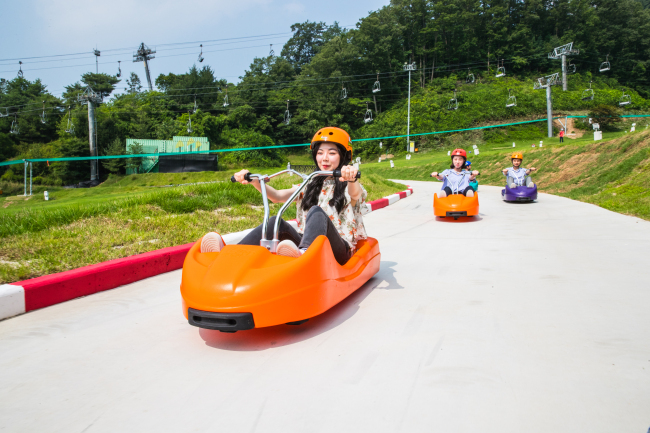 It operates between 10 a.m. and 9 p.m., and costs 15,000 won per ride, or 7,000 won for children accompanied by an adult. Children’s favorite place is located within the walls, inside the Ant World. The indoor theme park based on the theme of wandering around as an ant in a giant forest, it has mazes, gigantic slides, ball pits and other attractions that children can enjoy. It is easily one of the favorite places at the resort for pre-schoolers. The operating hours are between 10 a.m. and 7 p.m. on weekdays and 9 a.m. and 8 p.m. on weekends, and the fees are 26,000 won for children and 3,000 won for accompanying adults. Adults cannot use the facilities by themselves. For adults the VR Adventure arcade offers VR rides and video games. If you are prone to motion sickness, take caution when riding the rollercoaster, though -- I had to keep my eyes closed almost throughout the ride to stop myself from feeling nauseous. But shooting at zombies in a virtual world is fun, as are the other video games. The only major issue is that the arcade is quite small and has only three booths for video games, two more for head-to-head battle games. It could become an issue when the vacationers start crowding up the space. Each VR attraction costs 10,000 won a go, but you could also pay 50,000 won for unlimited use for some facilities for three hours. Ocean World has attempted to add elements of horror to the water theme park with the new attractions. The first floor of the Pharaoh’s Tower has the horror-themed attraction Pharaoh’s Maze, and the third floor of the building presents the new water slides Double Spin and Double Tornado. 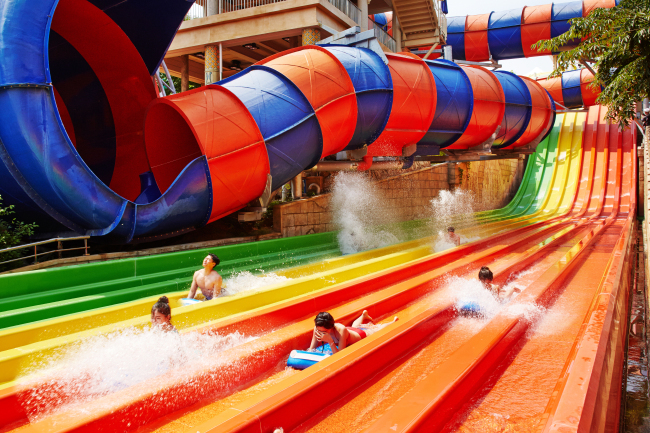 As its name suggests, the Double Spin goes through two curved courses in a four-person ride down the water slide. Double Tornado is also a four-person ride that has the tube slide down a giant funnel. As of last Friday, the Vivaldi Park resort added The Park Hotel to its accommodation. The Park Hotel, located right across the street from the Ocean World, is a brand developed by Vivaldi Park and has 79 rooms on 10 floors. Ant World is located on its underground level. All rooms have a double bed and a single bed, and the rooms offer a view of either the water park or the ski slopes. The Park Hotel is offering a package consisting of a night at the hotel, two tickets to the Ocean World, 30 percent discount at the Ocean World and 10 percent discount at its restaurants. For more information in Korean, English, Chinese or Japanese, visit the homepage of Vivaldi Park.